A group of researchers are working to develop the next generation of robots in the basement of the Engineering Center at CU Boulder. However, instead of the metallic droids one could be imagining about, these robots are developed from soft materials capable of reacting to applied voltage with an extensive range of motions. Such soft robots have remarkable potential for future applications as they can adapt to dynamic environments and are extremely perfect for closely interacting with humans. The soft devices are capable of carrying out a wide range of tasks, which also includes grasping delicate objects, such as a raw egg and a raspberry, besides lifting heavy objects. A key challenge in the field called “soft robotics” is a lack of “artificial muscles” or actuators that can replicate the performance and versatility of the real thing. 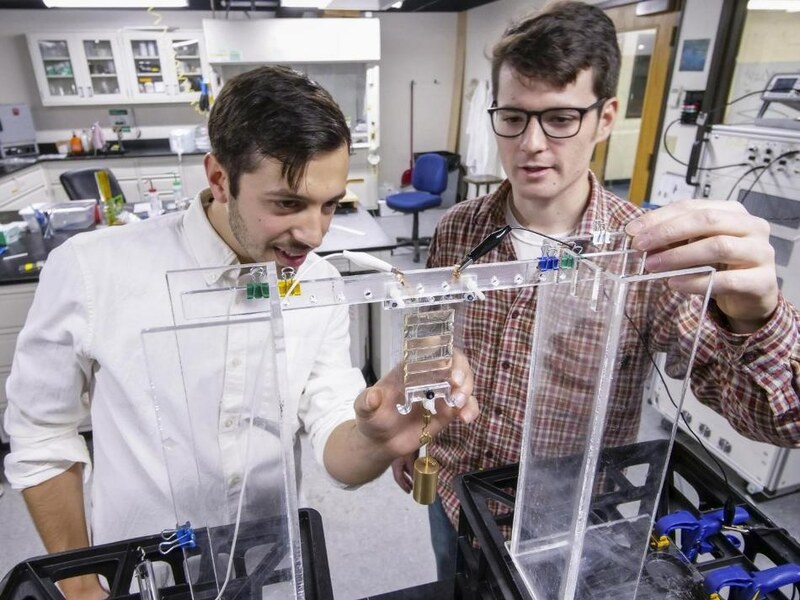 The Keplinger Research Group in the College of Engineering and Applied Science has now created a new class of soft, electrically activated devices that have the potential to mimic the contraction and expansion of natural muscles. These devices, which can be manufactured from a variety of low-cost materials, can self-heal from electrical damage and self-sense their movements, representing a key improvement in soft robotics. The recently produced hydraulically amplified self-healing electrostatic (HASEL) actuators avoid the rigid, bulky pistons and motors of standard robots for soft structures that match or exceed the strength, efficiency and speed of biological muscle. Their flexibility could enable a next generation of prosthetic limbs and artificial muscles for human-like robots. Three varied designs of HASEL actuators have been detailed in separate papers featuring in the journals Science and Science Robotics. We draw our inspiration from the astonishing capabilities of biological muscle. HASEL actuators synergize the strengths of soft fluidic and soft electrostatic actuators, and thus combine versatility and performance like no other artificial muscle before. Just like biological muscle, HASEL actuators can reproduce the adaptability of an octopus arm, the speed of a hummingbird and the strength of an elephant. One iteration of a HASEL device, explained in Science, comprises of a donut-shaped elastomer shell filled with an electrically insulating liquid (like canola oil), which is attached to a pair of opposing electrodes. The liquid is displaced when voltage is applied, and this brings about shape change of the soft shell. As an example of one potential application, the researchers arranged a number of these actuators opposite to one another and attained a gripping effect upon electrical activation. The grip releases when voltage is turned off. Another HASEL design is made up of layers of greatly stretchable ionic conductors that sandwich a layer of liquid and then expands and contracts in a linear manner upon activation to either flex a mechanical arm holding a baseball or lift a suspended gallon of water. Besides serving as the hydraulic fluid which allows versatile movements, the use of a liquid insulating layer also allows HASEL actuators to self-heal after electrical damage. Other high voltage controlled soft actuators, also called dielectric elastomer actuators, use a solid insulating layer that catastrophically fails from electrical damage. In comparison to this, the liquid insulating layer of HASEL actuators instantly recovers its insulating properties after electrical damage. This resiliency permits researchers to scale up devices in a reliable manner in order to exert greater amounts of force. HASEL actuators are also capable of sensing environmental input, just like human nerves and muscles. The researchers fixed a HASEL actuator to a mechanical arm and showed the potential to power the arm while sensing position simultaneously. A third design, explained in Science Robotics, and called a Peano-HASEL actuator, comprises of three tiny rectangular pouches filled with liquid, rigged together in series. The polymer shell is developed from the same low-cost material as a potato chip bag and is transparent, flexible and thin. Peano-HASEL devices contract when voltage is applied, just like a biological muscle, which makes them particularly attractive for robotics applications. Their electrically powered movement permits operation at speeds beyond that of a human muscle. The simplicity and versatility of the HASEL technology lends itself to extensive industrial applications, both in the future and also now. Research in the future will attempt to additionally optimize materials and geometry and also explore improved fabrication techniques in order to continue enhancing the HASEL platform and to rapidly assist practical applications. The researchers have obtained patents for the technology and are presently discovering commercial opportunities along with the help obtained from CU Boulder’s Technology Transfer Office. The research coming out of Dr. Keplinger’s lab is nothing short of astounding. He and his team of students are helping create the future of flexible, more-humanlike robots that can be used to improve people’s lives and well-being. This line of research is a core, interdisciplinary strength of our college. Co-authors of the Science paper include Shane Mitchell, Timothy Morrissey, Madison Emmett, Claire Benjamin, Madeline King and Miles Radakovitz of the Department of Mechanical Engineering. Shane Mitchell, Vidyacharan Gopaluni Venkata and Garrett Smith of Mechanical Engineering co-authored the Science Robotics paper.